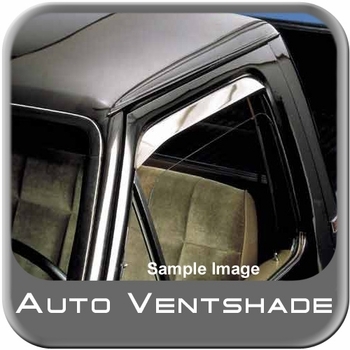 You will find an easy attachment procedure with the GMC S15 Jimmy Ventshade rain and wind deflector that will give you years of enjoyment as it helps control your interior environment. The Ventshade GMC S15 Jimmy deflector has a unique wind and rain design to enhance your driving experience by deflecting the outside elements and allowing the fresh air in. Help prevent windows from fogging with the installation of a GMC S15 Jimmy Ventshade deflector set and take back control of your cabin conditions allowing you the best driving situation. These Ventshade brand GMC S15 Jimmy steel wind deflectors are a must to keep out the rain and wind while allowing you to travel with your windows down to accept the exterior air in.